When the dam between Brunswick and Topsham opens, the Androscoggin River rushes over rocks and squeezes between steep banks, its sheer cascading force drowning out traffic on the Frank J. Wood Bridge above. Slung low across the water, with three arched spans, the bridge is a local icon. It was built in 1932, and its rusty steel trusses echo a time when the mills on either side still churned out paper and textiles. Photographers love how it frames sunsets and how, at night, electric light glints off the water below. Its profile adorned the local phone book last year. On Snapchat, it’s Brunswick’s “geofilter” stamp. All of which is why, even though the bridge has fallen into serious disrepair, a group of residents is fighting to save it from demolition. By day, Graham works as a commercial real estate broker and maple syrup producer. Originally from Weld, he moved from Portland to Topsham four years ago, drawn by the old homes and walkability. The bridge, he says, was also a big selling point. Like many Maine bridges, the Frank J. 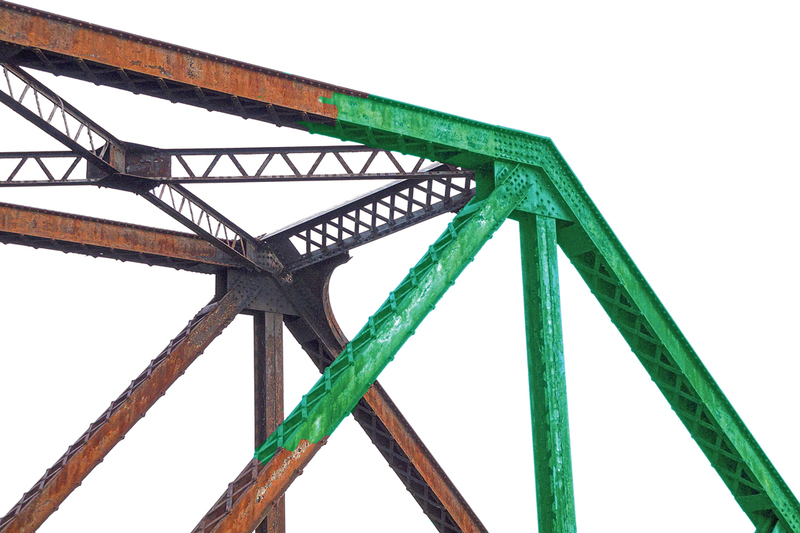 Wood — better known locally as the Green Bridge, for its now-peeling paint job — needs attention at a time when the state’s infrastructure budget is pinched. More than half of our bridges are at least 50 years old, and according to the American Society of Civil Engineers, 15 percent are in urgently bad shape, the Green Bridge among them. The floor system is failing, crossbeams are badly deteriorated, and sidewalk supports have corroded away. MDOT has imposed a new load limit, and stopgap repairs necessitate intermittent lane closures. While rehabbing the Green Bridge is feasible, MDOT says it would cost more than building a new one. Graham’s group, the Friends of the Frank J. Wood Bridge, has 10 committed members who, for the past year, have convened regular strategy sessions at Steve Stern and Arlene Morris’s Brunswick home. Stern is a retired engineer, Morris an artist whose studio sits just across the Green Bridge. There is a distinction between preserving because something is familiar and because it’s historically significant. John Shattuck, the Topsham economic development director, is one such from-away — technically. He’s lived in Maine for 45 years even though he originally hails from New York City. But where he grew up isn’t what most irks the Friends. Rather, it’s that he thinks the bridge is nothing special, either historically or aesthetically. An earlier controversy, Shattuck noted, played out with the former Waldo-Hancock Bridge, where Route 1 crosses the Penobscot River near Bucksport. That bridge — a stylistic predecessor to the Triborough and Golden Gate bridges — was completed a year before the Green Bridge, and the American Institute of Steel Construction named it the year’s “Most Beautiful Steel Bridge.” Locals loved it. But in 2006, MDOT discovered that the suspension cables had deteriorated beyond repair. Replacement plans moved rapidly, despite local opposition. Gradually, though, residents came around to the new design, which boasted grand obelisk towers and a 100-mile-view observation deck. This spring, officials from federal and state agencies held a public meeting about the fate of the Green Bridge. The MDOT project manager outlined options: put a new bridge on the existing base, build an entirely new bridge, or rehab the existing one. A full replacement, according to the state, would cost $13 million — the cheapest option, and one that would both allow for better pedestrian and cyclist access and require less long-term maintenance. When the presentation ended without public comment, the crowd stewed and shouted at the vacated podium. Graham and the rest of the Friends haven’t been as fortunate. MDOT announced in June that it would move forward with plans to replace the bridge, pending an environmental review process that could be wrapped up as early as the end of this year. And an advisory group of Brunswick and Topsham residents and town officials is already working with the state’s engineering firm to develop design ideas. Still, construction likely wouldn’t start until 2019. So meanwhile, the Friends aren’t giving up. They’re trying to win protected historic status for the bridge. They also plan to hire an engineering firm to reevaluate — and hopefully rebut — the state’s cost projections. And if all else fails, they’ve threatened to sue in federal court to halt the project. Graham is reluctant to even entertain the notion of defeat. But if the Green Bridge has to come down, he says, then he’d pressure MDOT to at least make sure the replacement design has some architectural character of its own. 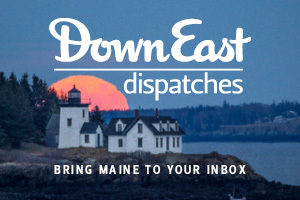 As a long-time subscriber, I appreciate DownEast’s coverage of the replace-or-repair controversy surrounding the Frank J. Wood that connects Topsham and Brunswick. The article you published, however, is both shallow and biased. It reads as a puff piece for the Friends of the Frank J. Wood Bridge, the group advocating restoration of the bridge. The article fails as a serious look at both sides of the argument. Reading the piece, there are some important things you wouldn’t know. You wouldn’t know that ME DOT has conducted an extensive, public section 106 process to review the case for preservation in which the ‘Friends’ have been fully involved as well as many others. You wouldn’t know that dozens of groups and individuals have spoken out for replacement, not restoration, including the Topsham Board of Selectmen and the Southern Midcoast Chamber of Commerce. You wouldn’t know that the ‘Friends’ cannot point to a single bridge renovation of a similar length that has come in costing less than the $13 million cost of replacement. You wouldn’t know that there is NO design yet of the new bridge, and that the two towns have appointed a Design Advisory Committee, soon to make its report, to advise ME DOT on a suitable design for this historic site. You wouldn’t know that the current bridge is dangerous for cyclists, or that every cycling organization that has weighed in has called for replacement. There were at least eight bridges between Brunswick and Topsham at this crossing of the Androscoggin before the current 1932 bridge. What is historic is the crossing itself, the succession of bridges and the succession of activities at the site. That history is what needs to be preserved. I expect better from DownEast. Replace it with one that is exactly the same but new. Fact-checked. He is, as it happens, both. Actually, the public “hearing” I drove 4 hours to attend was not a hearing at all. It was more a power point presentation selling the new bridge concept to a skeptical citizenry. ME Dot should at least go through the motions of an open mic session, writing down opinion, and gauging rather than this top-down approach. 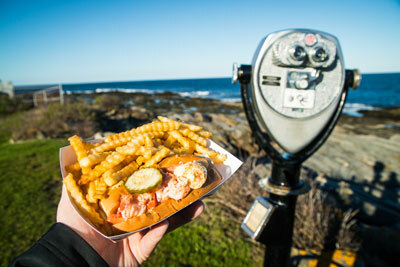 Like we do in NH. Formalities and traditions are important. The public should be treated with a modicum of respect. The posted notice for the meeting described it as a “public meeting” that would be held in “open house format.” It was never billed as a “hearing.” Comments on the project were accepted at the meeting in various formats, and accepted via mail or e-mail over the next two weeks to give as many people a chance to contribute to the discussion. The notice can be found at http://www.maine.gov/mdot/env/documents/PublicNotice22603.00.pdf. FHWA and MaineDOT conducted the meeting exactly as advertised. The format they chose gave the widest possible opportunities for public involvement. All the comments received were posted online and are available to anyone interested. Not much of an “open house format” or “public meeting” either. A “presentation” would have been more accurate. Because that is what it was. Give us something modern and elegant, perhaps a cable-stayed bridge like the Crusell bridge in Helsinki, Finland. You should see what amazing bridge work the rest of the world is doing. Make wind turbines a part of the top of the bridge and remove Brunswick Dam. The removal of the bridge weakens the historic mill district concept. By slamming a new style modern span across the void will weaken preservationists hand in preserving the overall mill district. This can be seen as a double bladed sword. By opening up unfettered development may spur some kinds of investment. The preservation of the mill district will encourage quality investment of another kind. The former “creative destruction” may pave the way for the breaching of the dam as well, not a necessarily bad thing from an environmentalist’s point of view. But it all starts with the bridge. I feel that a new bridge should be built. It would be a good thing to keep the old bridge but if the new one is built and the green bridge is kept as a walking bridge that who is going to take care of the malignance? It would probably fall on the towns. We don’t need more money spent the taxes are high enough. Remove the old bridge and build a new one.